Peter Kenney practically grew up working in restaurants. Perhaps that is why it feels so comfortable now to have his wife Deidre, who manages the front of the house, working at his side in their family owned and operated, award winning restaurant, the locals rave about. In fact, the two met while working in one of Saint Augustine’s favorite eateries, Gypsy Cab Company. With a shared passion for great food and the dream of owning their own restaurant is what brought the winning duo together. After months of planning, once Peter and Deidre found a great restaurant location, that had been recently vacated, and was centrally located in Saint Augustine Beach, they opened Purple Olive International Bistro in 2004. Their dreams quickly came to fruition. And, just as quickly, the restaurant developed a following of customers. Kenney’s menu reflects all of the experiences and influences he had along the way of his culinary journey. The Purple Olive offers a creative full dinner menu, nightly dinner specials, freshly baked artisan breads, and all homemade soups, salads, signature salad dressings, and desserts. Kenney goes one further with a unique menu option to “build your own plate” offering more than a dozen choices of entrees, sauces, condiments, and side items for customers to mix and match to please their own tastes. Kenny’s philosophy; The possibilities are endless…It’s time to eat purple! This stylish yet casual destination that gives patrons the freedom to exercise their own culinary creativity, is located in Seaside Plaza, at 4255 A1A South in Saint Augustine, Florida. To make a reservations call 904.461.1250. 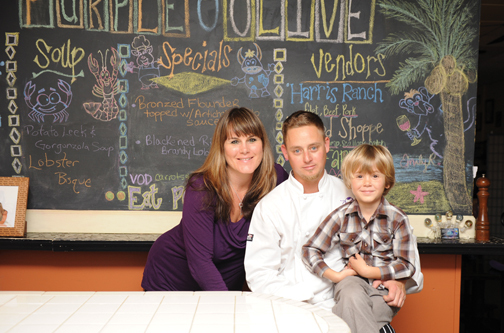 The Purple Olive also offers full service off-site catering for special events. Visit purple-olive.com for more details.